Failure to communicate long-term business strategy can lead to increased technical debt, because engineering decisions that aren’t aligned with business strategy can result in what later becomes technical debt. As business strategy veers away from the assumptions underlying those misaligned engineering decisions, engineers must alter implementations to track the strategy. Technical debt can form during those alteration efforts. Moreover, the expenditure of resources to support those alteration efforts might have been unnecessary if engineers had been better informed about long-term business strategy. In some cases, those resources could have been allocated to other pursuits, including technical debt retirement. To ensure alignment of engineering decisions with long-term business strategy, engineering decision-makers must be aware of long-term and intermediate-term enterprise strategy. When they’re well informed, they can anticipate the engineering needs of the enterprise. And they’re more likely to make decisions that are compatible with strategy. 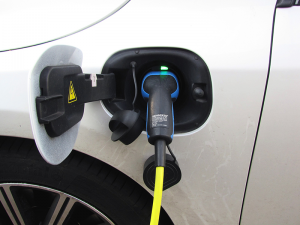 Recharging a plug-in electric vehicle. The dominance of petroleum-powered vehicles is nearing its end. Further investment in the petroleum-based fuels infrastructure is now inconsistent with what the global economy has chosen as its strategic intent. Electric vehicles are still out of the reach of most consumers, but they would be wise to favor long range vehicles. As electric vehicles become ascendant, petroleum filling stations will become more widely spaced, because they add to the metaphorical interest charges on the technical debt of yet-to-be-retired petroleum powered vehicles. During the transition to electric power dominance, a long-range petroleum-powered vehicle offers clear advantages over its shorter-range cousins. Moreover, the effect is bi-directional. Strategists can benefit from understanding the effect their strategies have on technological activity. For example, consider the process of choosing among strategic options. A favorable outcome is more likely if strategists know the effects of each option on the technical debt portfolio. To gain effective control of technical debt, senior management must regard the technical elements of the enterprise as strategic partners [Woodard 2013] [Ross 2000] [Brenner 2016a]. Policymakers can make important contributions to enhancing communication between strategists and technologists. For example, when engineers know the general direction of the enterprise, they can focus efforts on assets that are compatible with future needs. Inversely, when they’re unaware of what the business strategy might soon require, they’re more likely to make decisions that they must later rescind. What about legacy technical debt retirement? Analogous considerations apply to legacy technical debt retirement efforts. Major technical debt retirement efforts are often subject to review for alignment with enterprise strategy. But we tend not to review incidental retirement efforts that occur in the context of routine maintenance or development. Consequently, engineers might allocate effort to incidental debt retirement unnecessarily if the asset is due for overhaul or replacement. Communicating long-term strategy effectively is likely the most reliable way to prevent such misspent effort. Some managers elect to communicate business strategy to technologists only when they “need to know.” Often, technologists needed to know long before that. [Brenner 2016a] Richard Brenner. “The Psychology and Politics of Technical Debt: How We Incur Technical Debt and Why Retiring It Is So Difficult,” Cutter Business Technology Journal, 29:3, 2016, 21-27. [Ross 2000] Jeanne W. Ross and David F. Feeny. “The Evolving Role of the CIO,” in Framing the Domains of IS Management Research: Glimpsing the Future through the Past , edited by Robert W. Zmud. Pinnaflex, 2000. Available: here; Retrieved: December 20, 2017. [Woodard 2013] C. Jason Woodard, Narayan Ramasubbu, F. Ted Tschang, and V. Sambamurthy. “Design Capital and Design Moves: the Logic of Digital Business Strategy,” MIS Quarterly 37:2, 537-564, 2013.